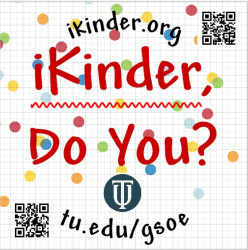 2014 CKA - iKinder, Do You? CKA hosts launch of iKinder statewide in California! Attendees: When the conference concludes, all resources and materials will be archived here. We promise to update our pages as we hear your feedback and support. Subscribe to text messages from our presenters hosted by Remind101. Address a text message to the number given in the "for more info" column. Then type the @word in the body of the message. Substitute the word given for "word" in the suggestion above. You can opt out of messages at anytime by replying, "unsubscribe @word". Subscriptions will expire in January 2015. We promise to be sparing and selective! C7: 21st Century Learning, PBL & Cross-age Partnerships with iPads! Remind101: Text 702-800-2519. Type @appily in the body of a text message. Remind101: Text 422-333-4489. Type @ikinder in the body of a text message.